There are often times that I look at my girls and have to remind myself that they are still 3 and 5 so that I don't expect more than I should. Part of me just wants them to grow up and be so independent and responsible... while the other part wants to squeeze them tight every minute of the day so that I can capture them and keep them at this age forever. Either way, I do believe that if children know what is expected of them and are taught to be accountable for themselves, their actions, their chores, etc, that it will help them grow up to be proficient, hard-working adults. While that might mean starting out with only a few jobs when they are young, as they age, they are able to take on more responsibilities and learn how the whole family works together. But... even though I believe that, that doesn't mean that my children jump at the chance to clean their room, put their clothes away or pick up their toys. Instead of having to use negative reinforcement (i.e. threaten them), I am always on the lookout for positive ways to motivate my kids and instill a sense of pride in themselves and their accomplishments. Which is exactly what you'll find at MyJobChart.com. My Job Chart is a free, easy to use, online chore chart and reward system for teaching, organizing and motivating your kids to Save, Share and Spend responsibly. By simply assigning tasks and chores for your children right online, they'll then be fully engaged in the process and rewarded for completing their jobs. 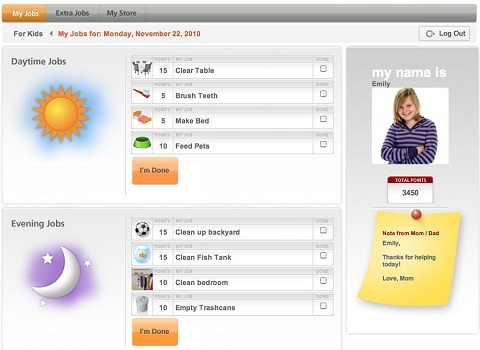 Children can log right into their account online and see the chores that they have been assigned for the day — parents are able to select from a pre-made list or customize their own selections. Each chore can be personalized for the frequency that it needs to be done as well as the number of points that the child will earn upon completing it. As kids complete their chores (whether a job is fully completed can be determined by the child or can be set to be approved by the parent), they are then responsible for marking them off online to earn their points. 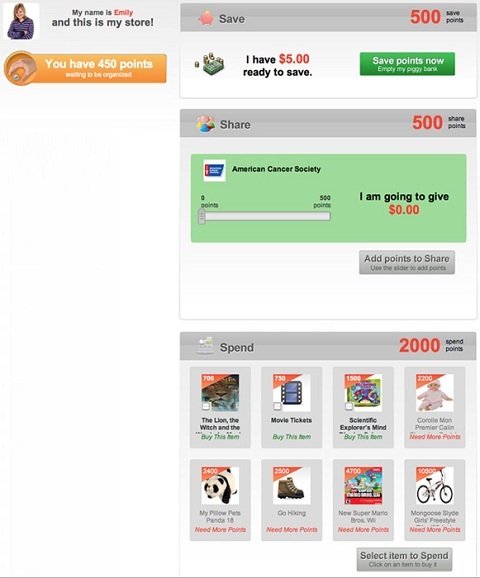 The points can then be saved, shared or spent, as they translate into actual money earned. This not only gives the child something tangible to work toward, but shows them how hard work equals being rewarded. I appreciate that My Job Chart allows parents to play the role of the banker or, for an easy way to keep things all online, they can set up a Kids Savings Account with ING Direct Bank. This account has great benefits (e.g. no fees, no minimum balance, a $20 bonus just for opening the account) so that children can immediately see how saving money works — whether for the long term, simply saving up to make a larger purchase, or in donating to help others. While my girls are a little too young to have a My Job Chart account right now, this is definitely a system that I can see using in the future! The site makes it easy to impart financial fundamentals in a technologically engaging way and that no matter what age, responsibility and work equate to value of a dollar. My kids already love feeling proud over their accomplishments, so I know that they would see compensation (and just what they can do with their money) as the next step. I strive for my children to grow up to be responsible, productive adults and using My Job Chart is a great way to impart lessons of work, saving, cause and effect, and more. I look forward to seeing my girls learn and grow throughout childhood, their teenage years, and into the wonderful adults that I'm sure they will become! I like that this combines something kids love (technology) with something we know is important to teach them. I wish they had this when my kids were younger... Thanks for the info... could it be used in a classroom??? ?